With their reality TV series, Antiques Sleuths, Brandy Borne and her quaintly kooky mother, Vivian, have a real hit on their hands. But another “hit” enters the picture, after a rival bidder becomes a one-woman show at their televised auctions—and it’s the estranged wife of Brandy’s police-chief beau, Tony! Soon the fine art of murder colors the scene, fitting Brandy for an ornately elaborate frame. But when you’re inside a frame, it’s difficult to make out the picture. That’s why Brandy’s mom—her daughter now wearing basic jailhouse orange—must sort through a rogue’s gallery of suspects including a too-friendly farmer’s wife, a ratings-happy TV producer, a questionable husband-and-wife auctioneer team, and even the chief of police himself. 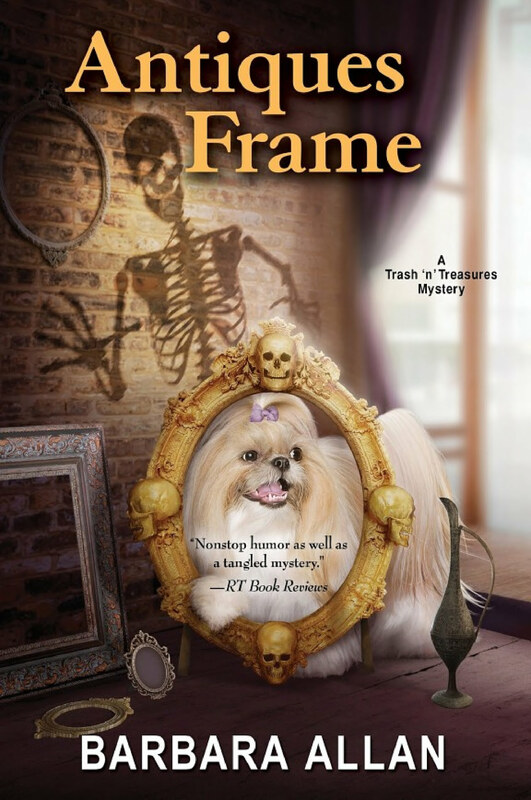 Brandy and Vivian race to determine how an empty antique frame can hold a deadly portrait, a picture worth a thousand dangerous words. 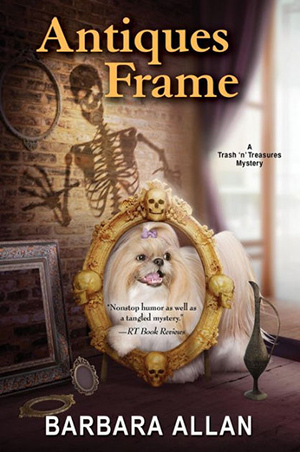 Aided only by Sushi, their loyal shih tzu, and police dog Rocky, the wacky mother-and-daughter sleuthing team must learn the killer’s identity before they become the subjects of another masterpiece of murder.